Could you use a good laugh? Even if you don't crochet, please check out the What Not to Crochet Blog. 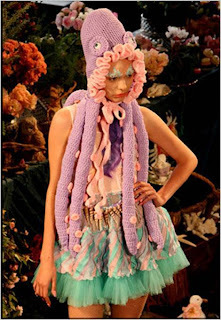 The picture above is a mere sampling and one of the less offensive of crochet offenses. I kind of like this one, actually - sort of reminds me of the Chicken Viking Hat... still determined to knit that one some day! Ellie - only you would like this! LOL. I can't imagine even conceiving of such a, uh, "garment"!